Nicki Minaj’s “Pink Friday” album has been taking the world by storm. She is the first female solo artist to have 7 singles on the “Billboard 100” at the same time. Nicki’s vibrant style and show stopping performances is putting her in a class all her own. Her popularity was very evident at The Fox Tuesday Night. The sidewalks in front of the venue were filled with die-hard Minaj fans sporting colorful outfits, bright colored wigs and vibrant makeup. The excitement in the air turned the already hundred plus day even hotter and the fully air-conditioned Fox Theater had no chance in cooling off this crowd. Nicki Minaj took the stage with style and gave a performance to remember. 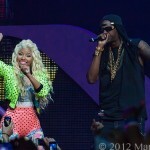 Nicki performed all her hits and even did a short duet with her opening act 2 Chainz. 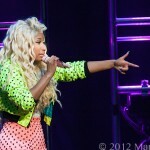 A full theatrical setting with multiple dancers and a vibrant light show was exactly what Minaj fans were looking for. Nicki is truly an artist and in my opinion, she has only scratched the surface of her endless talent.